Thought I’d talk a little bit more about the “See Rock City” barn photo I took that’s now on the front page of my new website design. Usually I think about the barns I see heading East/Southeast from Nashville towards Chattanooga, TN where the ROCK CITY GARDENS sit atop Lookout Mountain. But several years ago heading south after a show in Louisville, KY…I decided to take the “slow” road 31E instead of Interstate 65 home and found this beautiful one! I’d forgotten until then there were some of these barns so close to Cave City, KY where my mother is from…and probably some of the first ones I’d actually seen! Speaking of my mother and Cave City…this month’s FREE MP3 is the song “Rosemary” I wrote for her. 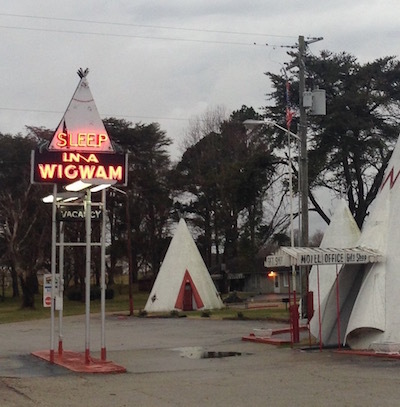 I’ve also included the pic I took that day of the WIGWAM MOTEL in Cave City. I always wanted to stay there when I was a little girl but we never did…next trip!